Director: Brian Yuzna / Writer: Richard Dana Smith / Cast: Corbin Bernsen, Jillian McWhirter, Jeff Doucette, Susanne Wright, Linda Hoffman, Clint Howard, Lee Dawson, Wendy Robie, Ralph P. Martin, Jim Antonio. Not having seen the first Dentist film, I’m at something of a loss to draw a comparison. However, at this was slasher movie #590 for me, it can’t be too damaging to hazard a few guesses based on what we’re told at the beginning of this sequel. 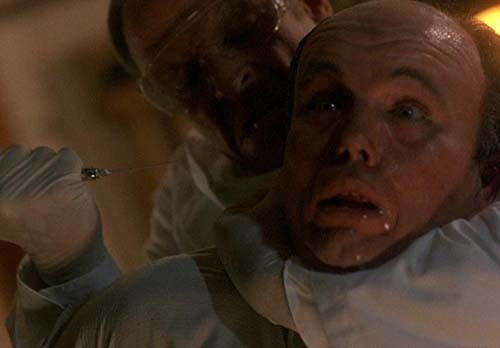 OCD dentist Dr Alan Feinstone has been rotting away in an institution for killing some patients in Round One (IMDb tells me the body count was four) after going mad when he discovered his wife (Hoffman) was screwing around behind his back. He breaks out of the looney bin, kidnapping a shrink on route and taking her car. What happens to her is left up in the air, but the body count could reasonably be cranked up by one. He winds up in the small town of Paradise where he acquires a safety deposit box with plenty of cash and aliases awaiting him and attempts to begin a quiet new life there as Dr Larry Caine. This plan is thwarted by the affections of pretty neighbour/landlady Jamie, and the haphazard local dentist, who ends up ‘falling down the stairs’ after botching a replacement cap for ‘Larry’. He reluctantly takes over as the new town dentist but soon finds that old habits die hard, especially when Clint Howard stumbles by after hours with a toothache and recognises Larry as Feinstone. He ends up buried under the rose bush. Jamie’s childhood beau also won’t go away and soon tempers fray, cranking things towards a bloody climax as Larry flips out completely. Despite not being familiar with this short-lived series, it reminded me of the likes of Devil in the Flesh and The Stepfather sequels; good quality video films that centered around loons trying to hide their deadly desires in the hunt for perfection and/or love. That said, The Dentist 2 isn’t an all-out slasher affair; Caine operates like a serial killer, bumping off people who get in the way or threaten to unmask him. The hook being dentistry, there is some absolutely grotesque closeup grue or wayward drills barrelling into teeth and needles sinking into oral flesh. If you’re at all anxious about your visits to the gob-doctor, safe to say avoid this one. The BBFC even cut 51 seconds of the longest oral-torture scene, which for the first time I was actually glad for. I’m less nervous of dentists now, though the sound of the drill still plays my spine like a xylophone. This one time, a rather untalented doctor screwed up the cap on my front teeth (which I broke aged eight), resulting in an overly long and sharp chomper that I had to FILE DOWN myself with a steel nail file when I got home! I digress: The Dentist 2 is nicely made, humorous, gruesome in place, and well above adequate on many levels. It just feels horrendously dated, like ten years older than it is. 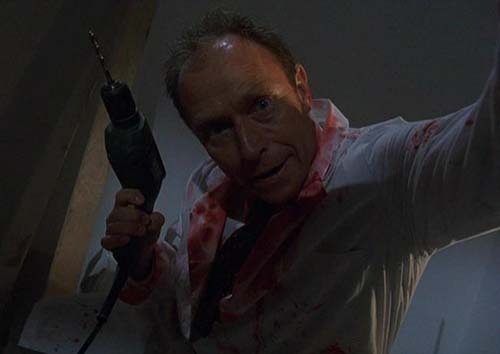 Bernsen is campy, entertaining villain with plenty of industry puns, and even though 14 years have elapsed, I’d certainly be keen to see The Dentist 3. Blurbs-of-interest: Yuzna and Bernsen both returned from the original; Bernsen was later in Dead Above Ground; Clint Howard had the title role in the Ice Cream Man. The Dentist 3: The Tooth Hurts. This and your reference to The Stepfather series got me thinking about slashery sequels to other films not typically regarded as slashers, like Boogeyman 2 and 3, or Hellraiser: Hellworld.